White truffles, Barolo and Barbaresco. Is there anything better in the fall? Not in my book. I was thrilled to host this small dinner for one of Vinous’s private clients. The truffles were abundant, as they should be, and the Nebbiolo flowed during a fabulous evening of great food, wine and conversation focused on the great wines of Piedmont. For the occasion I chose reference point wines with an emphasis on transparency so as not to overwhelm the truffles. We opened the wines around 4pm and double decanted everything except the 1997 Produttoris, which tasted a bit on the forward side. Dinner was served around 7pm. The wines were all fabulous. In particular, I loved the three 2006s, all of which were simply stellar. 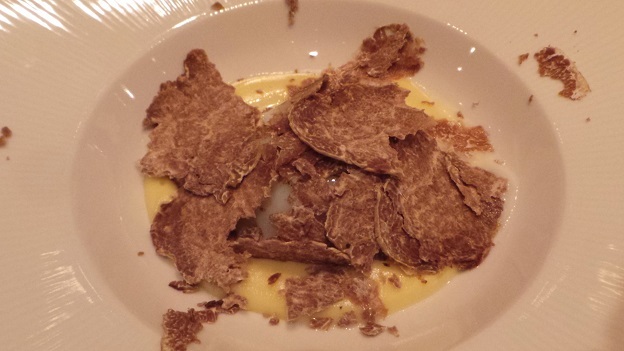 Our menu provides a series of perfect vehicles through which the discovery of the white truffle awaits. The 143-degree egg is superb. Another terrific dish for these wines, the capon is perfectly cooked and absolutely delicious. There isn't anything too surprising about our pasta and risotto dishes, both of which serve their purpose in highlighting the joys of the white truffle. How many dinners start with a wine of the pedigree of Luciano Sandrone’s 2006 Barolo Le Vigne? Not too many. The 2006 was incredibly tight when we opened, but after a few hours of air it is striking. What a wine. The flavor profile and tannin structure are decidedly classic, but the expression of fruit and overall texture are those of the modern school. This is a superb showing from the 2006. 97/Drinking window: 2016-2028. Mauro Mascarello’s 2008 Barolo Monprivato is a much more lifted and translucent wine than the 2006 Le Vigne. A wine that needs considerable air, the 2008 only starts to blossom with a few hours in the glass. Monprivato is often quirky, but the 2008 is a real moving target. Just this week alone I have tasted six bottles of the 2008 and found the wine a bit all over the place, especially compared to other wines from the same year. Still, with patience, the 2008 really sings. Ideally, readers should plan on cellaring the 2008 for at least another few years. 95+/Drinking window: 2016-2043. Things only get better. Is Giacomo Conterno’s 2006 Barolo Cascina Francia a traditional or modern Barolo? Great question. Texturally, the 2006 boasts marvelous depth and a level of pure intensity not often seen in traditionally made wines, yet the aromatics, tannin and overall structure are all super classic. This is another austere, tannic Barolo best left alone. 97+/Drinking window: 2018-2046. Giuseppe Rinaldi’s 2006 Barolo Brunate-Le Coste is beyond special. Initially hard as nails, the 2006 opens up gradually with time in the glass as it shows off its super-classic personality. On this night, the 2006 is utterly majestic. 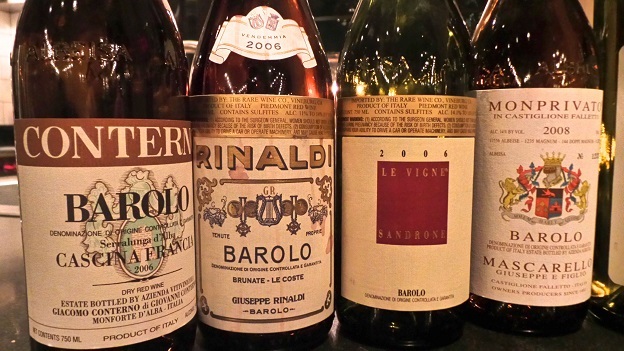 Readers who own the 2006 should be thrilled, as it is a magnificent Barolo through and through. 97+/Drinking window: 2016-2046. Two wines from Bruno Giacosa, both from magnum, are brilliant. 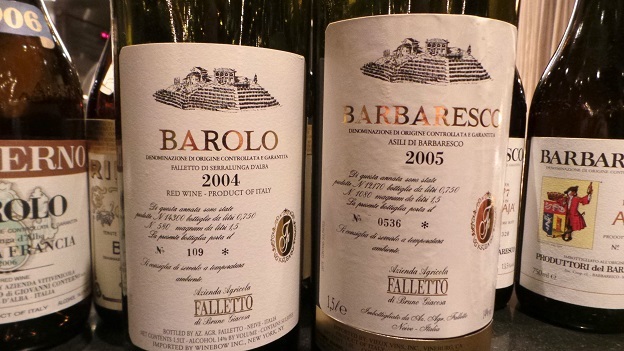 The 2004 Barolo Falletto (magnum) is deep, sinewy and exceptionally polished. Opened much too young, the 2004 nevertheless confirms the greatness of the year at Giacosa. Floral and savory notes are supported by firm tannins in a super-classic, taut Barolo endowed with magnificent energy and tension. Readers need to be patient, but there is a lot to look forward to. 95/Drinking window: 2016-2034. The 2005 Barbaresco Asili (magnum) is a bit more rewarding to drink today than the 2004 Barolo Falletto, although it is not likely to age as gracefully. In this classic Giacosa dried rose petal and spice notes are alive in the glass, but here it is the wine’s mid-palate that is super-expressive and generous. 95/Drinking window: 2014-2029. A pair of 1997 Riservas from the Produttori del Barbaresco round out the night. The Barbaresco Riserva Asili is soft, round and supple, with gorgeous depth and plenty of resonance. I expect that the 1997 will continue to age gracefully given the sheer depth of its fruit, although the aromatics are a bit forward. 91/Drinking window: 2014-2029. The Barbaresco Riserva Rabajà is quite a bit more structured and vibrant than the Asili. Dark, powerful and intense, the 1997 is absolutely gorgeous today. At the same time, it is impossible to miss just how much the Produttori have improved quality in the last decade. The older Barbarescos turn out to be a great pairing with the capon, as I had hoped they would. 93/Drinking window: 2014-2022. I can’t say enough about the food, setting and overall hospitality of our hosts. This was about as perfect a night of great wine and food as one could reasonably hope for.